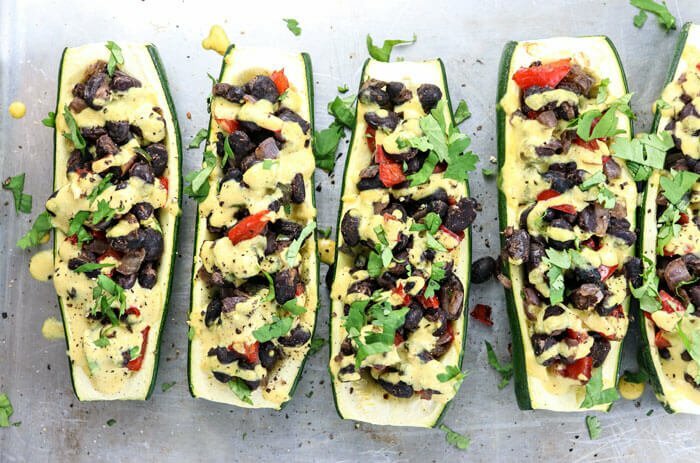 If you’re wondering what to do with all of your summer zucchini, this recipe makes an easy and delicious vegan dinner. You can whip it up in just about 30 minutes for a quick weeknight meal! I love using zucchini as a healthy alternative to taco shells and tortillas, as they are mild in both taste and texture, and take very little effort to prepare. 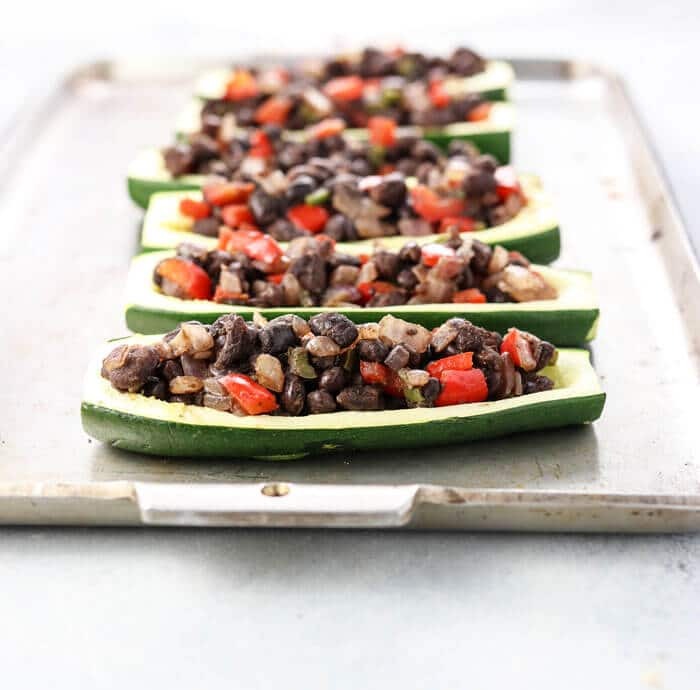 In this recipe, zucchini squash are sliced lengthwise with their seeds scooped out, baked until fork tender, and then stuffed with a Mexican-style black bean mixture. Topped with a drizzle of vegan cheese sauce, they become total vegan comfort food and make a perfectly light summer meal. Zucchini squash are low in carbohydrates and calories, and are brimming with fiber and vitamin C, which helps promote a healthy immune system. They also contain potassium and magnesium, which may help to keep your heart rate and blood pressure at healthy levels. Black beans are thought to help build healthy bones, as they contain essential minerals like calcium, magnesium, phosphorus, and zinc. Here’s how to cook black beans from scratch. The fiber in black beans may help to lower total cholesterol and decrease the risk of heart disease. Cumin is thought to boost digestion and relieve gas issues, which makes it perfect for pairing with beans! This spice is also rich in iron and vitamin C, to help boost immunity and promote healthy circulation. Onions are loaded with antioxidants, which may help protect the body from free radical damage, and amino acids, which are the building blocks of protein. When you eat a variety of plant foods, the body combines these amino acids to get the “complete protein” it needs. Tahini is high in vitamin E and also contains calcium, making it a great alternative to dairy in this vegan “cheese” topping. I love that it keeps this recipe nut-free, too. Since this is a quick skillet meal, you can use any other veggies you might have on hand and simply adjust the seasoning to your taste. Keep in mind that you’ll be stuffing this filling into unseasoned zucchini shells, so I tend to go a little heavier with the salt and seasonings to compensate for that, but it’s always a safe bet to start with less and add more as you go. Feel free to customize as you see fit! 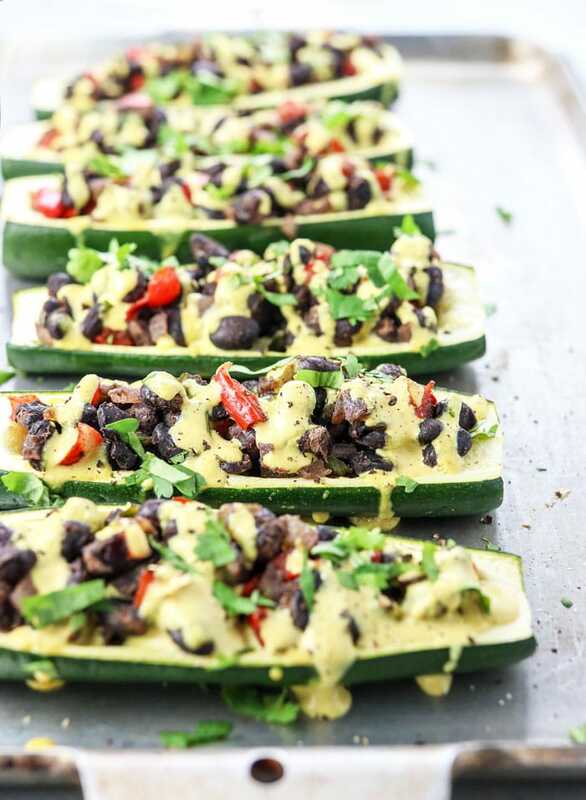 Stuffed with a Mexican-style black bean filling and topped with a vegan cheese sauce, these fork-tender stuffed zucchini make a filling vegan dinner. Perfect for summer! Preheat the oven to 350ºF. 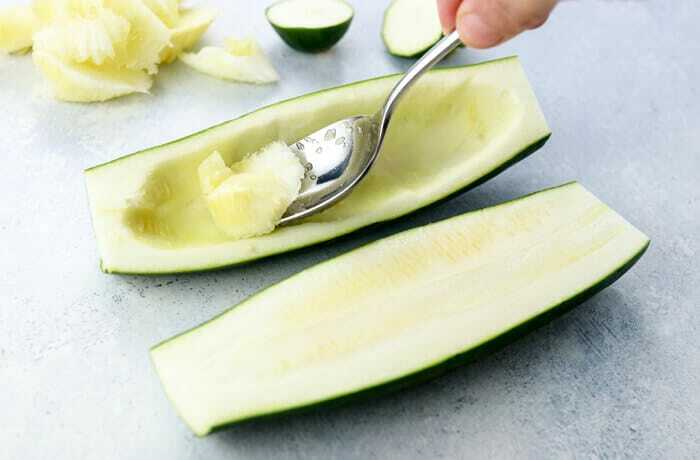 Slice the top and bottom knobs off of each zucchini squash, then slice them in half lengthwise. Use a spoon to scoop out the center seeds of each squash, creating a crevice that will hold the black bean filling. Arrange the squash halves, cut-side-up, on a large baking sheet and bake them at 350ºF until very tender, about 20 minutes. While the squash is baking, heat the olive oil in a large skillet over medium-high heat and saute the onion and pepper until they start to soften, about 5 minutes. Add in the garlic and saute another minute. Add in the black beans, cumin, salt, and chili powder, and stir until everything is heated through. Turn off the heat and let the vegetables sit in the warm pan until the zucchini is done cooking. 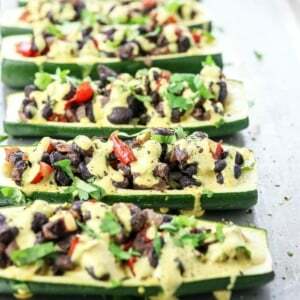 To assemble, remove the zucchini from the oven and fill each half with plenty of the hot black bean mixture. Top with a generous drizzle of tahini sauce and garnish with fresh cilantro. Serve warm. Note: If you'd prefer to top with real cheese, I'd return the stuffed zucchini to the oven and broil them until the cheese is bubbly, about 1-2 more minutes, before serving. What should you do with your scooped-out zucchini seeds? You can toss the scooped-out zucchini seeds into the skillet with the beans and veggies for an extra nutritional boost, if you like, but I actually prefer to save them in an airtight container in the fridge and add them to my smoothie the next morning. They add an extra nutritional boost to any sauce or smoothie, without adding any extra flavor. Can I use another cheese topping? If you’re not dairy-free, feel free to use real cheese as a topping if you prefer. Just sprinkle cheese over the stuffed zucchini and place it under your oven’s broiler for 1-2 minutes, until bubbly. You could also use my cashew queso recipe or sweet potato queso recipe if you prefer. Can I make another substitution? Because this is a skillet-meal, it’s pretty easy to make any substitution you like and just taste the filling as you go. Just trust your taste buds and experiment however you like! I think you could probably use another type of bean, add meat if you’re not vegetarian, or even use a pseudo-grain like quinoa for another plant-based protein in the filling. If it’s not zucchini season for you, you might try stuffing this mixture into eggplant, spaghetti squash, or bell peppers as an alternative. As always, if you make a modification to this recipe, please leave a comment below letting us know how it worked for you, so we can all benefit from your experience. Reader Feedback: What’s your favorite way to use up summer zucchini? My Coconut Flour Zucchini Bread is next on my list! I tried this today and it was lovely! I’ve been vegan for a year and a half now and I still really struggle trying to find things I like so I’ve definitely bookmarked this recipe. I find I never luke tahini based sauces so I left that out and I actually saved the stuff I’d scraped out of the zucchinis and put it in with the rest of the stuff in the frying pan, about 2 mins before I turned the heat off. I think doing that really helped because it seemed to absorb all the flavours really well. Fabulous recipe! I added (extra firm) tofu scramble and pico de gallo to the veggies… luckily, I had doubled the recipe! That cheese sauce is sensational. It almost reminds me of gruyere or a Quattro formaggi! I think they’d last up to 5 days. I’m a potbelly guy determined to eradicate it from me, I’m not a vegan but I substitute the fasting period in my diet to a full vegan diet. I find it a lot of fun and follow your recipes to the dot. Thanks guys. This is absolutely delicious (with either zucchini or yellow squash). I was recently diagnosed with breast cancer, and have radically (and I do mean RADICALLY) changed my diet and lifestyle in order to literally save my life. This recipe is chock-full of all the healthy things that I now eat, and it tastes divine. Thank you for posting it. Very good! Thanks so much for sharing this awesome recipe. OMG!!!! THIS IS AMAZING!!! The tahini sauce tastes like CHEESE!!! I have been vegan for a week now and this recipe will definitely be apart of my meal plan as often as possible!!! LOVE LOVE LOVE IT!!! Great recipe. You have to try the version that uses the zucchini guts in the filling. Yes! I added the seeded portion back to it before I added the garlic and it was amazing! I’ve made this twice so far and love it. I used hard sheep cheese for topping though. I also put more chilli powder in. Great recipe which will become a regular in my diet. I made this tonight and it was delicious! I added diced carrots and celery to the filling and sprinkled finely grated cheese on top. Thank you for the great recipe! I made this tonight, and when I put it on the table, my 10- and 6-year olds immediately told me how they “do not like zucchini”. I asked them to give it a try, and they ended up enjoying it (although they did tell me how they liked the filling more than the zucchini 😊). This was a very tasty and quick meal that we will be making again. Great way to use some of those zucchini from our garden. Thanks once again, Megan! I made this tonight and both my husband and I loved it!!!!! It was super fast and easy to make. It’s okay to combine beans and tahini? I thought that was improper food combining.